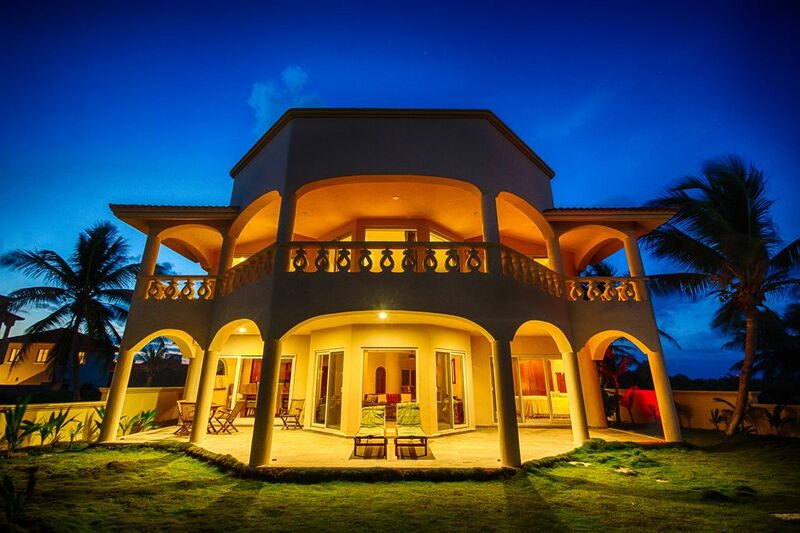 TURTLE HEART VILLA, a luxury beachfront villa on sandy, marine turtle nesting beach. Newly renovated September of 2016 we have even more to offer. There is now a kid's room with smart TV and separate A/C, there is also a gym with free weights and a bike on a trainer. All rooms have sea view! New curtains, furniture, new pool deck with grill, new paint inside and out etc...the villa is pristine. Location: Tulum on the Riviera Maya, Mexico. Turtle Heart Villa is located directly on the beach where hundreds of turtles (Loggerheads, Greens and Hawksbill) nest annually. This spectacular and unique location combines both breathtaking beauty and the natural wonders of an intriguing environment unlike any other along the Riviera Maya. You can capture the marvels and the mysteries of turtles nesting from May through February from the balcony of this beautifully appointed grand villa. If luxury and privacy is your desire, TURTLE HEART VILLA offers the finest of all amenities. Boasting a spacious floor plan, this 5500sq. ft., three floor, “smart home” is designed to surpass the desires of the most discriminating vacationer. Lounge poolside in a hammock amid lush, tropical vegetation while enjoying an icy drink, surfing the net with wireless connection or catching up on your reading. The sundeck is a great venue for a BBQ fiesta. The rooftop patio boasts breath-taking panoramic views of the Caribbean. Complimented with plenty of casual seating, sunbathing beds, lounge bar, massage table and the romantic charm of a million stars on a clear evening. The simple, yet sophisticated, design is the place to totally relax in the sun or shade with complete privacy. This is one of the premiere places in the world for viewing turtles where they nest and hatch. Many guests consider this, “the best room” in the house. The exercise enthusiast can enjoy the gym available upstairs in a private studio. This is shared with the new kid's room with two twin beds and smart TV. Spa services such as massage, manicure and pedicure can also be arranged during your stay. For the chef or food connoisseur, create a fabulous meal in the fully equipped gourmet kitchen with all professional-grade Viking appliances, superior accessories, and handcrafted dining table for twelve. If you prefer, our experienced chef will gladly prepare and cater to your dining wishes. Please ask for details on this service. The sleeping accommodations offer three air-conditioned, individually styled theme master suites surrounded by windows and terraces. The Mexican Room, with one king and a day bed, features high ceilings with a brick doomed ceiling, spa bath with walk-in sea view shower, private bidet and toilet, accented with Mexican art, wall textures and hand-carved furniture. In the Yucatan Room you will be pampered in a huge spa bathtub created with native stone, open shower, twin onyx sinks with mahogany details. Marble floors are throughout the villa and in the Yucatan Room they are accented with a grand bath and sculpture. This room has one king sized bed artistic designed from hand-carved mahogany. This bedroom has a flat-screen cable TV with surround sound, and DVD player. The Bali Room is all about soothing the soul with Balinese handcrafted furniture of tropical woods, and a beautiful custom bathtub with hand shower. The king sized canapy bed is luxuriously comfortable and the day bed provides room for a friend or a lounge sofa. The casita is now open as well. The casita is separate from the main villa. It is a fully cantained 'house' with full kitchen, shower and toilet, sofa, dining nook, very many windows, so it is bright, amd you have a sea and pool view, from you private balcony. The entire villa with casita can sleep 8 adults and 4 children sheer comfort and style. (More children if they are babies). We are located just five miles from Tulum town, where you can visit the only seaside ancient Mayan ruins. Tulum is a growing beach community complete with shopping, restaurants, a hopping nightlife, fishing, diving, and jungle tours. So much more. There is a wealth of wonders to experience in the Mayan Riviera, Mexico and Turtle Heart Villa appeals to everyone, while sharing one common denominator… a lasting memorable experience filled with fun, relaxation, and adventure. Note: No smoking inside villa. Air conditioning in each bedroom so guests can choose the temperature or to enjoy the sea breeze. Your maid will do your laundry for you at a nominal charge. Parking is onsite and in a covered garage. We supply all towels, including beach towels. Super fast wireless service provides you with a connection anywhere in the house, outside, on the roof or by the pool. The living room is very comfortable with over-stuffed wicker sofas and chairs. The room is open onto the kitchen and dining creating the 'great room' feel. Lighting is all on dimmers for atmosphere. Professional Grade Refrigerator with freezer and automatic ice maker. There is a vast selection of spices and condiments available. Professional grade VIKING appliances with all the gourmet cookware any food enthusiast would desire. This is a kitchen to entertain or be entertained. Chef available at request. The dining area comes complete with a custom made mahogany table and 12 high back wicker chairs. The room is surrounded with the view of the sea. Cable TV with surround sound system in first floor bedroom. Another TV is upstairs. Both Flat Screen TV's have DVD players. The villa has two portable music systems and a few docking stations for your listening pleasure. Guests can also bring their own portable speakers. Bluetooth is available. DVD is included with the entertainment system. The upstairs has a full balcony that runs across the entire beach side of the Villa. Downstairs has a full porch area with lounge chairs. There are several porches and balconies for your outdoor convenience. The front entrance is surrounded with a marble porch (over-looking the pool) and the beach side is as well. There is a deck by the pool for seating or having a cook-out. The grill is complete with a tiled working counter and sink. Bring your snorkel and fins, you will not want to miss the being in the sea. Alternatively, equipment is easily rented. Come and see turtles in the sea!! Beach shoes recommended. World class golfing is readily available. Maya Coba (site for the PGA many times) is just 20 minutes away, Bahia Principe is merely 10 minutes away. Too many courses to name, take your pick. Beautiful and large, the pool is complete with a deck and an outside grill area. Lounge chairs, cushions, tables and a hammock under the shade of coconut trees. We provide you with 5-star service which begins on inquiry. This extra value allows you to have a carefree holiday as reservations for all activities can be made right from the Villa. If you desire to have spa treatments we just order it up and the spa comes to you! We can organize all activities from deep-sea fishing, boating, sunset cruising, diving, snorkeling, dinner reservations, personal training, spa treatments, water parks, trip to the ruins, (Tulum, Coba, Chichen Itza), cenote parks, caverns, and jungle tours. You name it and it is here! This villa is a very nice place in a 5-star location. The house staff kept it immaculate during our stay, and they offered laundry service for 100 pesos per small load. The recommended chef service was amazing and really made our trip feel similar to staying at a resort. Each meal was incredible and they cleaned up afterwards too. We had 2 families along with us and there was room for everyone. The kids LOVED the pool and the snorkeling in the cove down the beach. We decided not to use the casita, as it is in need of some updating. Our only issue during the trip was that the power went out several times for hours at a time, and the water also ran out for about 1/2 a day. This villa REALLY needs a generator. All of the places around us seemed to have one, and when you are paying this much money, you want access to appliances, your electronic devices and especially air conditioning!! Our chefs had to be very creative for several of our meals as they only had access to the gas stove. Sleeping without the a/c was almost unbearable and although we understand that everyone did their best to get the issue resolved each time, it really did cause us some discomfort. I will be asking on a go-forward basis if the rentals I plan on booking have generators for power outages. That being said, we had a REALLY great vacation and Zubet definitely did her best to accommodate us before and during the entire trip!! This is a great home to book with a group of friends or family. The 3 bedrooms in the house ( our group didn’t require the guest house ) all had very large bathrooms, and a/c in each room when you need to cool off. -Bring tough bottom water shoes for sure as there is a good amount of rock/coral and you will defiantly want to get in that water. - When leaving the house to the beach, go left for about a nice 10 minute walk along the water and there is a cute little beach side restaurant called Chamicos to grab food and drinks at. - Just one building over to the left on the beach is a small hotel that has a beachside indoor restaurant overlooking the water as well. - Casa Cenote is right up the street from you, and across from that is a small market. In this review there are some valuable tips to enjoy the area even more. Also nearby (in this gated community) are five restaurants, manatee cenote (this is a wonderful cenote to snorkle or scuba in) and the beach is right out your door. You can walk to all the restaurants. Right now it’s TURTLE SEASON! We already have three nests. In total last year we had over 150, right in front of the villa! In 2017/2018 we released 5000+ baby turtles. Our conservation efforts have really made a difference in the turtle population in our area. It is truly an amazing experience to see the mommas come in to lay their nests and the babies hatching and going to sea. Turtle season begins in late April and our last nests typically hatch out in early January. The prime months to see laying and hatching are June, July, August and Septmeber. We welcome you to join us in our efforts to provide a safe nesting habitat for these magnificent, endangered creatures. COME JOIN US TO SEE THE TURTLES! Wonderful house! The house is new and spacious with spectacular views. The kids loved playing in the pool and the adults loved hanging out on the balcony. Your objective for this beach is not strolling or snorkeling, but turtle watching and the turtles did not disappoint. We were there in July and every night it was like turtle Normandy often with half a dozen turtles laying eggs at the same time. We didn’t see any hatchlings but that had to be quite something to see too. Zubet took care of everything we needed and the trip went very smoothly. I recommend hiring the personal chef that Zubet recommends. It was affordable, the food was amazing, you save so much time versus sitting in restaurants, and if you have food allergies to deal with, it’s especially wonderful. Thank you Zubet for a once in a lifetime experience!!! Thank you. It was nothing but a pleasure to host you and your family. Myself and my staff are here to roll out the red carpet and give our guests the best holiday ever. We can organize anything you desire and our location provides a very easy luxury home base for so many of the wonderful activities available here in the Riviera Maya. Come and see the turtles! We’re waiting for you! My wife and I just returned from a week at Corozon De La Tortuga which we shared with another couple an their two younger daughters (9 and 4). The house is beautiful with very high-grade furniture and uniqure architectural touches made from very high quality materials. You get the feeling that a lot of thought went into the design and construction of this wonderful house and it has held up very well - still looking new in it's ocean-front location. This was my first time staying in the Tulum area as we had friend's down the beach celebrating a birthday - having stayed in the Akumal area for the last 6 visits. I can say that this area is definitely a step up in all areas that originally attracted me to Akumal 10 years ago - privacy, ocean-front villas, beachfront restaurants with very good food, proximity to other attractions along highway 307, value. The owner and staff really go out of their way to meet requests and help to make you feel at home and provide details if it is your first visit. We took advantage of the chef services on 4 occasions and had 4 wonderful meals and a very good value. We were always looking forward to get back home to Corozon De La Tortuga after a day of adventures up and down the coast! We have just returned from a very memorable 14 days stay in Tulum, staying at the gorgeous beach front villa Corazon de la Tortuga (Turtle Heart Villa). The property is just incredible with many high-lights including secluded but safe location, lovely spaces with comfortable beds and stunning bathrooms, beautiful pool and surroundings, mins from tavernas and cenotes, but the best is being able to sit on the villa steps and watch the sea turtles making their way to the beach to make their nests and lay eggs and subsequently watching the eggs hatch and the wee baby turtles make their way to the ocean. A truly magical and privileged experience. The villa manager and staff were outstanding, nothing was too much trouble. The house and rooms were cleaned to a very high standard daily and for a small fee our laundry washed and folded. We stayed in the villa with friends and 3 children under 5 and it was a more than comfortable and safe environment. We used the chef services a couple of nights, the food was delicious and it was a treat to be waited on without having to leave the house! There are so many exciting things to do around the area, Explor and Xel Ha were particular highlights as was the Tulum Ruins and awe inspiring Chichen Itza (one of the 7 new wonders of the world). I would not hesitate in recommending Corazon de la Tortuga to anyone wanting to explore this beautiful part of the world and thank Zubet and Francesca for helping make our stay comfortable and worry free. We stayed in this home for one week, 2 families both with 2 kids (ages 5 and 8). It was perfect! The pool was a big hit and provided lots of entertainment when we were home. Very comfortable home. There were several highlights of staying in the house. The turtles laying eggs on the beach-every night we saw several of them and it was a truly magical experience. The housekeeper and groundskeeper were the most friendly sweetest people. The woman who lives on the property was beyond helpful. We had a chef, Irma come in for 3 nights and she was amazing to say the least-the food was incredible and so was the service! I really can't say enough good things about our experience staying here. Highly suggest to anyone looking for a wonderful home to stay in Tulum. You must type the numbers with the spaces exactly as written above and you will be directed to the Villa and the surrounding area so you may get a great idea of all we have to offer! Your beach is directly on a protected turtle conservation area. You will see loggerhead and green turtles nesting and hatching directly in front of the villa on the beach! Cenote diving/snorkeling, fly-fishing, cavern exploring, Mayan Ruin tours, water parks, ATV tours, turtle watching, scuba, SUP, deep sea fishing, beachcombing, river rafting, many ruins, water attractions, shopping, great dining, music and dancing, kite-borading schools and serious kite boarding fly here, great food, funky little bars and high end dining as well. Just three easy driving hours to world famous Chichen Itza, Tulum (only riuns in Mexico on the beach) is just a 10 minute drive, Coba (very interesting ruin in the butterfly jungle and you are premitted to climb the castle, only ruin left where you are premitted to climb it. Lots of fun day trips, great shopping, no hassle, friendly Mayans who are no pushy but very friendly and service oriented. So much to mention. Just ask if you have anything you desire. We can make it happen. Whale shark season in September. Do miss it!